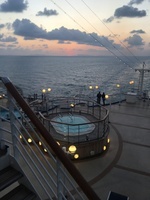 we chose this cruise as it is a destination we hadn’t been to before, we were not disappointed. 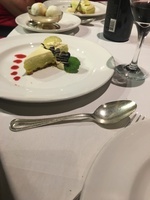 The Saphire is a lovely ship, very easy to find your way to dining rooms and activities, the entertainment on board is varied and suits all tastes, The Drop band had a good range of music and entertained us in club fusion, around the pool on at sea days and in the Explorers lounge. The trivia games were fun and tested our knowledge. The art auctions, balloon drop, deck parties and movies under the stars plus shows in Princess theatre provide entertainment for all. The tours were well organised by the excursion team were reasonably priced and interesting. Great service in the dining rooms especially for people with food intolerance. Loved seeing Kuala Lumpur Petronis Towers. Chinatown in Singapore, James Bond Island excursion is well worth the 90 minute bus ride not suitable for people that have mobility issues though. Our mini suite on the starboard side was clean comfortable and plenty of room with the sofa bed in the mini lounge area great to stretch out and read a book or entertain out on the balcony. the bed was a queen bed and very comfortable loved the chocolates on the pillow each night. we arranged for a private tour with Lovina Bali Tours, our driver Yogi Samykha picked us up at the port of Benoa after a tender boat ride, we went Ubud silver market, Tengenuen Waterfalls and had lunch at a restaurant in Vissasa Retreat in Ubud very peaceful place. The traffic was a nightmare as it was a celebration day for Balinese people we made it back to the wharf in time to catch one of the tender boats back to the ship thanks to Yogis great driving skills. Interesting tour the wood carvers work all day on sections of this temple you can have a go at carving if you want to, it is a beautiful temple. The bus took us to Pattaya afterwards for beach or shopping at the markets, there is a modern shopping centre 5here as well. we went to Long Tan battlefield and walked through the Long Phuoc tunnels where the vietcong were based near american and australian military camps in 1966. very interesting guide explained the history and events of tha5 time and showed us the memorial to all the fallen soldiers on both sides. We caught the Princess shuttle bus into KL which took 90 minutes and arrived at Oetronis Towers, we picked an early time slot when booking the tour it was a great experience magnificent architecture then we had time to do a little shopping in Chinatown catching a taxi there. I wouldn’t recommend going to Chinatown though not any bargains better to stay in the city and walk around the gardens. great day out, swam in the warm water, had lunch at a beachside restaurant and walked back to the bus stop shopping along the way, it was very hot make sure you have water, sunscreen and a hat. The downside to this excursion was the litter on the beach and in the water we saw a child’s shoe floating past us with shellfish growing on i5 as we swam. we caught the princess shuttle bus to nha trang which stopped outside a city hotel from there we walked to the main market area, then went to the Sailing Boat Club for lunch opposite the beach, you can get a taxi from the market to this club. Suffolk House where Sir Francis Light established a magnificent house and schools and trade, also went to Chou Jetties housing on stilts and market stalls, temples and shrines can be found, also visited Georgetown where British influenced buildings are in existence. Interesting day out although a 90 minute bus ride took us to the jetty to catch a long boat out to James Bond Island, views of limestone cliffs and lunch at a muslim fishing village and schools and mosque with more markets where yo7 can buy pearls, clothing, fans, clothing and silk scarves. Exciting boat ride and wonderful views. We walked off the ship and a caught the train to Chinatown where we shopped and found great bargains, ate lunch in Smith Street and had a tiger beer. It was easy to find our way back to the ship, the trains are efficient and cheap way to get around singapore.